So, you have decided to purchase physical gold and silver from a coin shop. This is a very important decision you might want to think twice, as buying precious metals from a coin shop has its pros and cons. Before you even walk into a coin shop. Mike Maloney says in his book "Guide to investing in gold and silver" (page 172. Chapter 'Beware The Pitfalls') "Please, please, please do your due diligence and develop a relationship with a dealer you've researched". Do your due diligence! We mean it. You need to get as much information and knowledge about these places, as well as from the people "behind the scenes". Why? Because most likely you have never been to one coin shop, and it's not like you're going to that restaurant where the owner knows you and you get free chips. Use Google Map to search out any local coin shops close to you. Make a list of the ones you are interested in. Write their physical address, contact information and web site address (if they have one). Having a "top three" list is enough. Word-of-mouth is the strongest marketing tool. Getting positive feedback regarding a product or a service that comes from a third party is so powerful, that you typically want to try that product or service. Of course, it works the other way around. Try to get feedback from people that have been to that coin shop you want to purchase gold and silver from. Even outside the coin shop before getting in for your first time, you might want to get some feedback from customers who are exiting the place. Knowing the spot price of both gold and silver is crucial, for many reasons. Considering that the spot price determines the current price of the rough metal in the international market, you just want to make sure the coin shop is not going to sell you an ounce of gold and silver at the current spot price. If they want to, just walk out. Why? Most likely the purity of those metals are not what you're looking for. The are some labor, manufacturing and shipping costs for creating a single coin. Actually, the coin shop dealer should look at the live spot price right after you ask: "how much is this silver coin?". They need to know the spot price! Otherwise, how are they going to determine the cost of that coin? Seriously. If they don't look at the spot price, just walk out. * What is the premium compared to spot? The premium (amount of money an investor is charged for the product over the value of the metal the coin or bar contains) compared to the spot price should vary (depending on size) between 5% to 20% for smaller-sized coins and investment bars. For large investment grade bullion bars is between 2% to 5%). * What methods of payment do they accept? Most coin shops don't take credit cards. However, they do take cash, personal checks and even Bank Wire. This last option tells a lot. 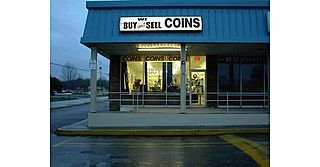 Coin shops that have been around 10 to 30 years migth have an established credit, bank account and reputation on the block. Watch out for the coin shops that don't have a bank account where you can wire funds to. * Are there any minimums required? Any maximums? Can you purchase 1,000 ounces of silver at the coin shop? If they don't have them in inventory, what are the procedures? * Are there any return and sell back policies? Lets suppose you just purchased 20 ounces of silver from the coin shop. Two days after you just want to return them and get your cash back. If they tell you "black" over the phone and when you get there they tell you "white", just walk out. * How long has the coin shop been in business? This information certainly tells the story, literally. A coin shop that has been around 30-40 years most likely is a trustworthy place to buy physical gold and silver from. As the "gold and silver fever" gets more common every time, a few new coin shops will eventually appear on the block. Beware of them. We are not saying "don't buy from them", just one more time: do your due diligence. * The bigger the city, the better. Chances are that there are more trust worthy coin shops in a big city, rather than in a small city or town. Their reputation in the community and in the market is extremely important. Remember, we are not dealing here with tennis shoes, but with money: gold and silver. Would you purchase $10,000 dollars worth of gold and / or silver at the coin shop? How private could this purchase be? Probably is not as private as you might think it is. People inside the coin shop will notice you just purchased a serious amount of gold and silver bullion. At that very moment, the transaction is not private anymore. Unlike buying gold and silver online, people will notice you just purchased the safest tangible assets today: precious metals. It is crucial to create a relationship with your dealer. There are hundreds of documented cases where, in some way or another, coin dealers literally steal customers' gold and silver bullion. For example: Sometimes people send their metals to his coin dealer to get a bid. They wait for a few days and actually get a bid back from the coin shop, but they never get neither the cash their metals are worth, not their metals back. Click here to read about a recent case like this one and many more. * Reporting to the IRS? If a customer buys directly from GoldSilver.com, all transactions are private. When selling their gold and silver bullion, some trades are private and some are not. Click here to learn more. Do I have to pay taxes for buying gold and silver at a coin shop? Oh, yes. Transactions less than $1,500.00 will require you to pay some TAX (depending on the city you are buying at). Back in 1980, people who didn't have pure silver got 30% less of its real value, due to the fact that the dealer "didn't have a relationship with the refinery". They would use this against you, if you have an "urgent" need of cash. We don't find any reason why not to invest in pure gold and silver. Anytime the customer shows the urgent need for cash, coin shops will always tray to take advantage of this situation. * You need cash? Watch out! Lets put is this way. Mike Maloney says that, even there are good and honest people in the industry, "there are many sharks out there that will like to take your currency", and the guy in the coin shop could be one of them! If you show up at the coin shop with your coins and bars, pretending to simply cash them out and walk away, it's not that easy. Well, it might be easy, but sometimes not that fair. They will certainly use that "need cash" situation against you, paying a lower price for your gold and silver coins and / or bars. Gold and silver dealers have created all kinds of myths around numismatic coins. If you are not familiar with this kinds of coins, coin dealers will take advantage of this and you will eventually lose money. Click here to learn more about Numismatic coins and to avoid a scam in this field. - Being followed - You get to the coin shop and there are some folks hanging around on the street (most likely, you don't know them). Are you planning to purchase your gold and silver and walk out? Remember...you don't know these people and you coudl easily get robbed. They are out there for less than coins and bars. Just in Stockton, California, there have been 77 gold chain robberies since March. Click here to read more. - Would you purchase $10,000 dollars worth of gold and / or silver at the coin shop? How private could this purchase be? Probably is not as private as you might think it is. Why? You not at the privacy of your home. You are letting the coin shop dealer know that you actually have $10,000 dollars. What if there is people around you when making the purchase? That doesn't sound to be very "private". Unlike coin shops, if you buy gold and silver online through us, all transactions are private. - Camera system - If there is a camera system outside and inside the coin shop, that's a good sign. However, this doesn't necesarily mean that something could not go wrong. Everytime, more and more people are aware that there is something going wrong with the economy, where precious metals are playing an important role. Gold and silver's purchasing power never goes to zero, unlike all fiat currencies'. Not only it is important to know when to invest in an asset class, but also knowing when to get out. Precious metals are in their cycle and in a bull-market which "it still has a long way to go, but it won't last forever" - Mike Maloney. When to sell? Most coin shops might not even know what an Exit Strategy is, nor they will care to inform you when the right time to sell is. In most cases they will only try to sell their gold and silver. Becoming a GoldSilver Insider will give you acces to Mike Maloney's Exit Strategy. All of the above are things to consider when deciding to buy gold and silver from a coin shop. Remember to "Please, please, please do your due diligence and develop a relationship with a dealer you've researched."